In this perception survey, carried out by the Herald with financial and technical support from the Sustainable Development Policy Institute (SDPI), Islamabad, we asked the respondents to rate the health service provision by various administrations during the last five years. They were also asked to identify five key issues related to the provision of health services. We additionally asked them what they thought of the expenditure made on healthcare by various governments and how they managed their personal health-related expenses. 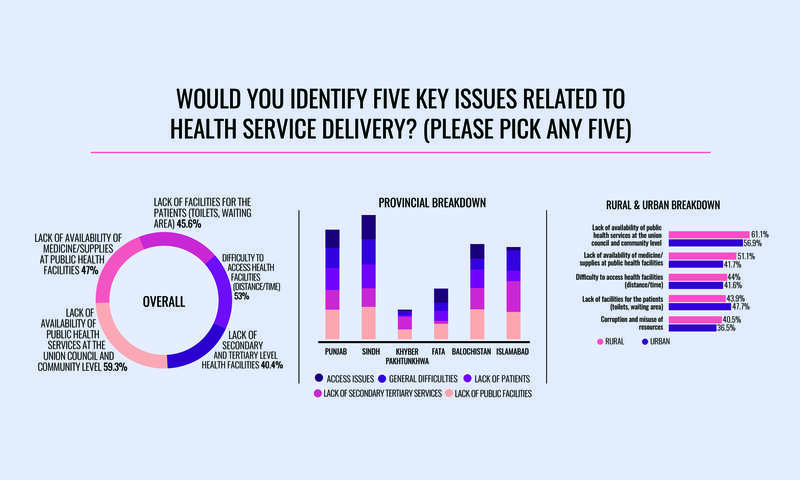 The responses reflected how well (or badly) different provinces manage the health sector. We then calculated the average of all the responses to form a national baseline of public perceptions about the health service provision. This showed that 44 per cent respondents saw health service provision as average – neither good, nor bad. Another 23 per cent were of the view that the provision of health services is above average or excellent and 32 per cent rated the provision of health service as below average or very poor. Likewise, a national baseline (average of responses from all the four provinces) on key issues related to health service delivery was also prepared. These issues include lack of availability of public health services at the union council and community level (highlighted by 59 per cent respondents), difficulty to access health facilities due to distance/time (flagged by 53 per cent respondents), lack of availability of medicines/supplies (recorded as a key issue by 47 per cent respondents), lack of facilities for the patients (pointed out by 46 per cent respondents), lack of secondary and tertiary level health facilities (underscored by 40 per cent respondents) and corruption/misuse of resources (indicated by 39 per cent respondents). A sizeable number of respondents (42 per cent) rated the health service provision in Punjab as average. This is just a little short of the national baseline. 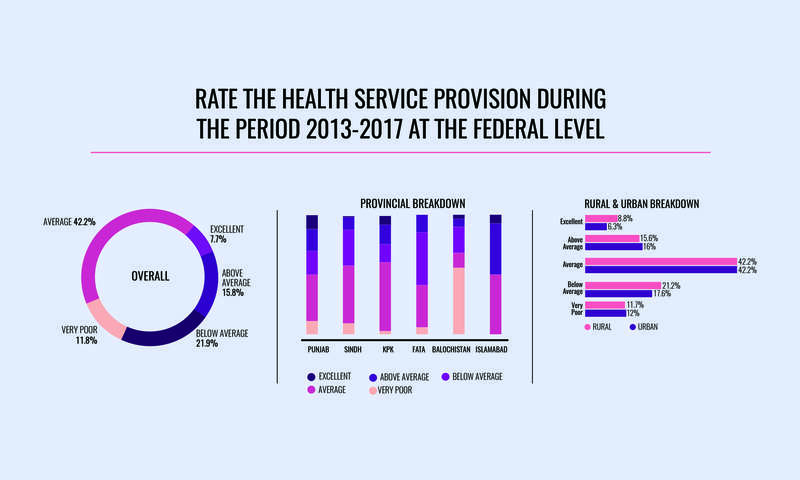 Another 30 per cent respondents, much higher than the national baseline, termed the provision of health services in the province above average or excellent whereas 27 per cent (significantly lower than the national baseline) rated Punjab’s health service provision as below average or very poor. In other words, compared to the national baseline, Punjab is doing better. 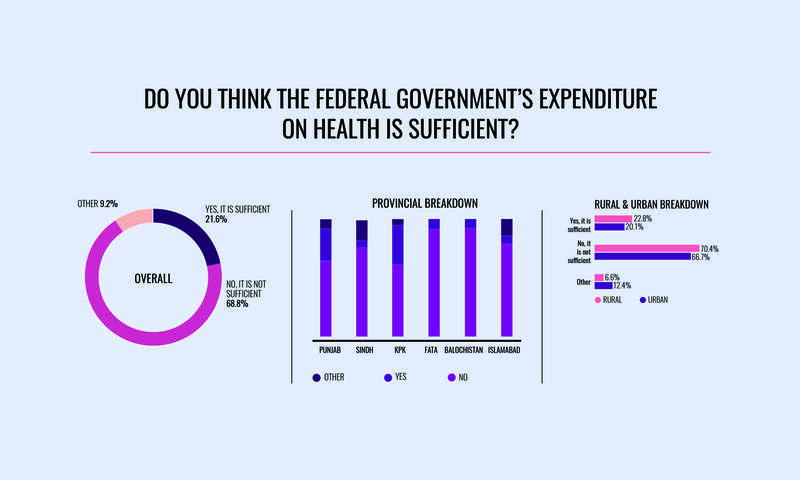 A majority of the respondents (59 per cent) thought that the provincial government’s expenditure on health services is not sufficient whereas 32 per cent perceived the government’s spending in this sector as sufficient. When it comes to the five key issues, lack of availability of public health services at the union council and community level was pointed out by 62 per cent respondents; lack of facilities for patients (waiting area, toilet, etc) by 46 per cent respondents; lack of availability of medicines/supplies at public health facilities by 45 per cent respondents; difficulty in access to the facilities in terms of time/distance by 42 per cent respondents and lack of secondary and tertiary level facilities by 41 per cent respondents. It is important to note that 37 per cent respondents ranked corruption and misuse of resources, 35 per cent respondents flagged behaviour of staff at health facilities and 34 per cent respondents pointed to the non-availability of doctors as the key issues in the province. Another 30 per cent respondents highlighted the non-availability of lady doctor as an important issue. These responses endorse that the focus of the Punjab government is on infrastructure development or brick and mortar projects (communication and transport and electricity) and that too in major cities. This is why a large number of respondents have complained about the lack of public health facilities at local level. Complaints about corruption, behaviour of staff and non-availability of doctors also seem to contradict the general perception of Punjab as a ‘better managed province’. 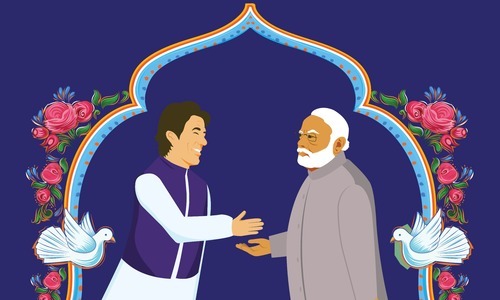 The perception of exclusion and marginalisation among the residents of peripheral and remote districts only suggests that there is a difference between a ‘shining Punjab’ and a ‘suffering Punjab’. The recent defectors from the ruling Pakistan Muslim League (PMLN) have cited this “exclusion and marginalisation” of their constituencies as a major factor behind their decision. This may not be entirely true in each case yet the ‘suffering Punjab’ needs to be taken care of by the next government if it wants to turn the province into a model of governance. The percentage of the respondents who termed the health service provision in Sindh as average and those who termed it below average or poor does not differ much: 48 per cent of them termed health service provision in the province as average (this is in line with the national baseline); another 44 per cent (much higher than the national baseline of 32 per cent), however, termed it below average and or very poor. Another major (negative) departure from the national baseline is seen in the case of “above average and excellent”; only 7 per cent respondents from Sindh (compared to the national average of 23 per cent) rated health service provision in the province as above average or excellent. Similarly 76 per cent respondents felt that the government expenditure on health is not sufficient; only 7 per cent termed it sufficient. The key health-related issues identified by the respondents were: lack of availability of public health services at the union council and community level (by 68 per cent respondents); difficulty in access to the facility in terms of distance/time (by 53 per cent respondents); access to health facilities due to road and transport problems and lack of availability of medicines/supplies at public health facilities (each by 51 per cent respondents); lack of facilities of patients (by 49 per cent respondents) and corruption and misuse of resources (by 47 per cent respondents). Close to 40 per cent respondents complained about the behaviour of staff at health facilities, a similar number complained about the lack of secondary and tertiary level facilities and 34 per cent complained about the lack of availability of doctors at public health facilities. Like Punjab, one also sees a clear difference between the health service provision in major cities and interior Sindh. The major difference perhaps is that in the case of Punjab one can identify many major cities with reasonable public sector health facilities while in the case of Sindh it is difficult to name a third major city (in the context of public health service delivery) after Karachi and Hyderabad. While one observes a ‘shining’ Punjab and a ‘suffering Punjab’, in the case of Sindh, one observes a ‘suffering Sindh’ and a ‘slightly less suffering Sindh’. If our respondents offer a perfect sampling of the national public opinion, then the health service provision during the last five years has remained least satisfactory in Balochistan. Only 17 per cent respondents termed it as average; 7 per cent termed it as above average or excellent and 76 per cent viewed it as below average or very poor. That 91 per cent respondents deem the government spending on health sector as insufficient is only another indication of this large scale dissatisfaction. Unlike Punjab and Sindh, where lack of availability of public health services at the union council and community level is seen as the most pressing health related issue, in Balochistan it is the third key issue, highlighted by 62 per cent respondents. The most important issue identified by our respondents in Balochistan is the lack of availability of doctors at public health facilities, highlighted by 73 per cent respondents. Then come the lack of availability of medicines/supplies (highlighted by 64 per cent respondents), lack of availability of lady doctors (highlighted by 53 per cent respondents), lack of secondary and tertiary facilities (highlighted by 44 per cent respondents), corruption and misuse of resources (highlighted by 43 per cent respondents), lack of facilities for patients (highlighted by 39 per cent respondents) and problems in access to health facilities (highlighted by 31 per cent respondents). These results endorse a general perception of the failure of governance in Balochistan which has led to increased insecurities among the residents of the province. My hypothesis is that when an individual insecurity interacts with a collective identity crisis, be it is ethnic, sectarian, provincial or any other, it leads to a clash between “haves” and “have nots”. The perception of exclusion, marginalisation and deprivation in Balochistan is rooted in the insecurities created by the failure of governance and will continue to threaten development initiatives such as Gwadar Port and the China Pakistan Economic Corridor (CPEC). The next government (both at the federal as well as the provincial level) will have to take care of these insecurities, not only to improve the social indicators of Balochistan but also to keep its social and political fabric intact. The public perception about the healthcare provision in Khyber Pakhtunkhwa is way better than the national average. A majority of our respondents (54 per cent) termed provision of health service in Khyber Pakhtunkhwa as average; 26 per cent termed it above average or excellent (three per cent above national average) and 18 per cent termed it below average or very poor. 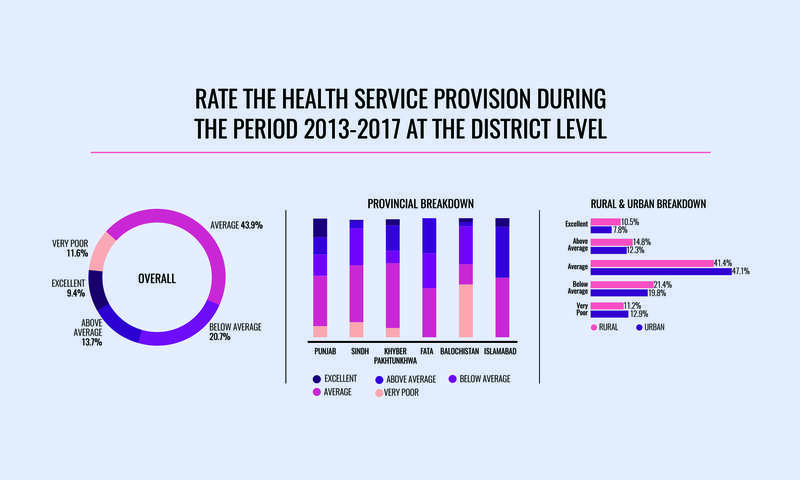 The last category, which shows the level of dissatisfaction with health services, is almost half of the national average – and way lower than in Punjab and other provinces. 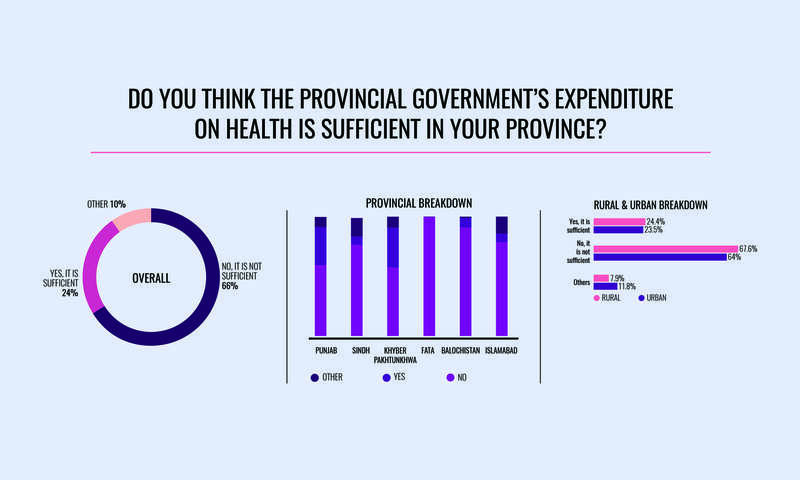 Despite this rather positive public opinion, 57 per cent respondents were of the view that the provincial government needs to spend more on health services and 33 per cent deemed the current level of spending as sufficient. On both counts, the province has performed marginally better than Punjab. Our respondents in Khyber Pakhtunkhwa also show significant departure from the countrywide baseline numbers in at least two key issues concerning healthcare: corruption and misuse of resources is identified as a key issue by 24 per cent of them, compared to 38 per cent nationally. Similarly, lack of availability of medicine/supplies is highlighted by 41 per cent respondents in the province whereas the national average is 47 per cent. On most other issues, negative approval rating is less than that of every other province, including Punjab that gets a slightly better rating on the access to secondary and tertiary healthcare facilities. The two provinces are also tied on the access to healthcare facilities in terms of time and distance. When it comes to the provincial governments’ performance in the health service provision during the last five years, one can see a visible change in Khyber Pakhtunkhwa where the level of satisfaction with public health services is higher than in other areas. Punjab government has, on the other hand, focused on infrastructure and energy-related projects which has led to a situation where major cities of the province are in a better condition (including in terms of health service) but the remote and peripheral districts are still suffering, thus creating two provinces in one – a ‘shining’ one and a ‘suffering’ one. In Sindh, the level of dissatisfaction with health-related services is quite high. With very small percentage of those who rate health service delivery as above average or excellent, we can see that half of Sindh is ‘suffering’ and the rest is ‘slightly less suffering’ when it comes to public health facilities. Balochistan, on the contrary, is presenting an entirely gloomy picture. Cost of inaction there will erode our national, societal and social fabric which no one can afford. 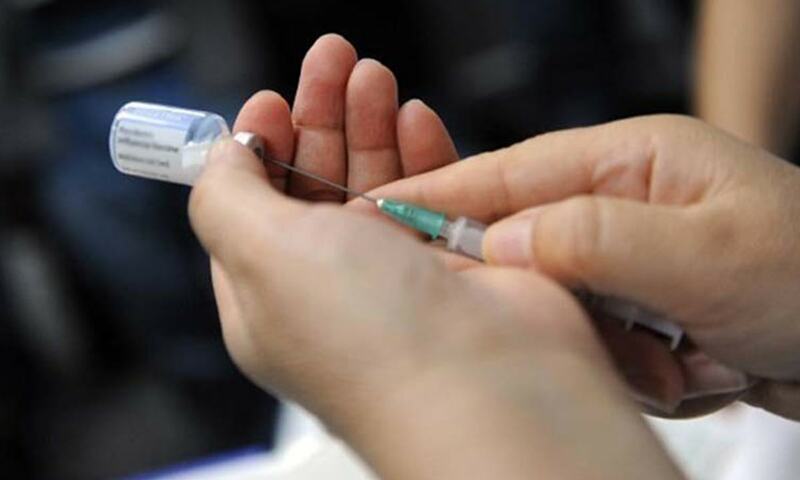 Next governments, both at the federal and the provincial level, will have to impose a health emergency in Balochistan. Otherwise it will be too late to rectify the situation. This is the second part of our end-of-term public opinion poll. To read the first part, click here. PMLN will be distributing Sweets after this Report. Until they get an Urdu version of this report. Kudos PTI. Imran khan the best. Medical Teaching Institutions Reforms Act in KPK brings visible change in healthcare at tertiary/ specialized healthcare level. Furthermore , increase in numbers of doctors and paramedics staff shows strengthening of healthcare setups at primary and secondary level. Health Budget increase giving the output in Highest public Satisfaction level. Even it is marginally better than Punjab in 2018, but in 2013 it was far behind than Punjab and why more than 80 consider it is average or above average because they didn't see such facilities in their lives. Lahore had been the capital since the times of Mughal and then RajaRangit Sigh and had been in focus in British rules as well whereas KP and Peshawar had been ignored since day one. Had PTI in govt in Punjab in 2013, it would be in far better situation than today because it was already a developed province whereas PTI had built KP almost from scratch which was devastated by war of terror and corruption.